Long-sleeve men’s shirt in brown and blue. Lion is a style of long-sleeve shirt with retro blue and brown floral print that rounds off a Trachten outfit, with brogues and Lederhosen, splendidly. It comes with double-buttoned cuff and swept collar with matching blue and brown chevron print on the inside, punctuated by red dots. 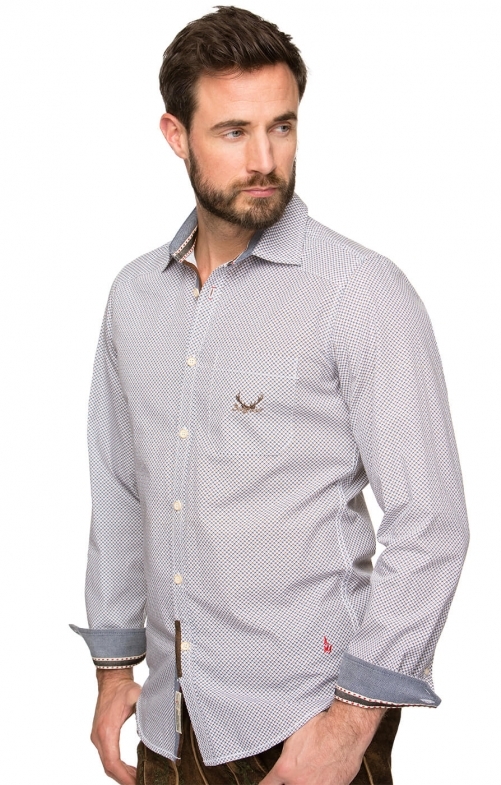 A French front placket, a patch pocket on the chest with an ornate antler embroidery, and a decorative loop on the yoke give this traditional Bavarian shirt style its unique retro look. Fällt recht klein aus. Sehr schönes Hemd, nicht nur zur Tracht.